No Limits! 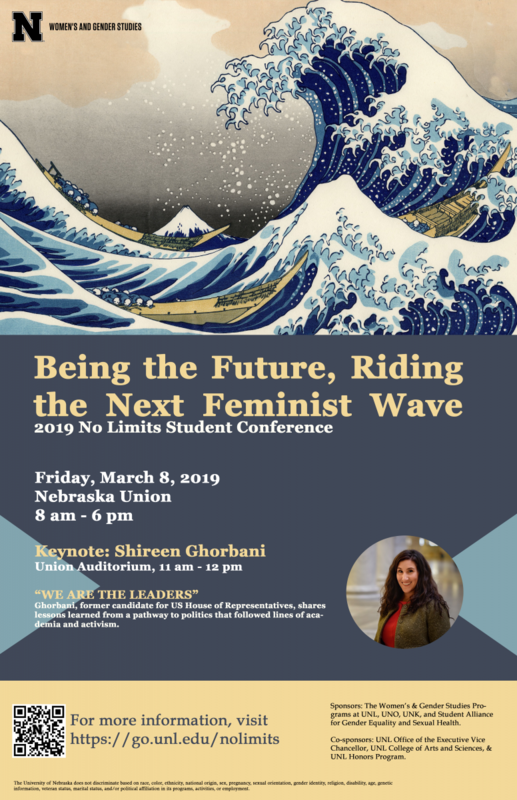 is an interdisciplinary student conference that explores a wide range of issues related to women, gender, and sexuality. Undergraduate students, graduate students, and recent graduates are invited to submit proposals to present their academic research, creative project, or activist work on women, gender, and/or sexuality. Pre-registration is officially closed. If you were unable to register in advance, you'll be able to do so at the conference. There will be registration table in Fischer Louge all day starting at 8:15 am. If you did not pre-register online, you cannot receive the complimentary lunch. However, there will be space in the Centennial room if you'd like to bring your own lunch and join us. *We have reserved a block of rooms at the Graduate Lincoln. See here for booking instructions.